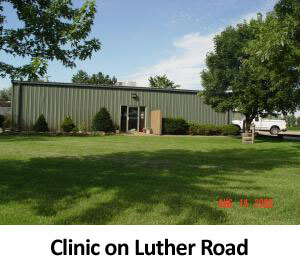 The main facility is located at 4127 Luther Road in Fremont, Nebraska. 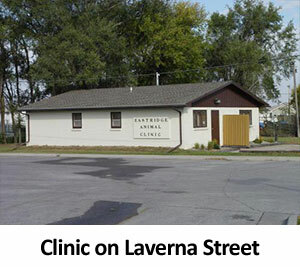 We maintain an outpatient clinic located at 2345 Laverna Street, also in Fremont, Nebraska. This Veterinary Practice has been in existence for over thirty years providing full service care for animals in and around the Fremont area. We are predominantly a small animal practice, but provide care for a select group of large animal clients. We do not provide veterinary care for horses. Emergency service is provided both during and after regular office hours. Pet owners in need of emergency service after hours, can reach Dr. Verner by dialing the clinic number, 402-727-9900, and electing to dial O during the playing of the recorded message. An answering service operator will respond and take information and page the Doctor. We encourage owners to first attempt to reach their pet's regular veterinarian. This practice makes every attempt to inform owners of costs of veterinary care before services are performed. Detailed written estimates for services are prepared and discussed with pet owners. If selection of which veterinary practice you chose to care for your animal is based primarily on costs, please don't hesitate to discuss options and alternatives to the recommended services and procedures. We have a number of resources for you to learn about how to take better care of your pets. Browse around and look at our articles and pet videos. Two major considerations in increasing the quality and quantity of life for pets is appropriate nutrition and preventative healthcare. If you want to ask a question please call or email us and we'll promptly get back to you. Our office is very easy to get to, and you can find directions on our Contact Us page. We would like to become actively involved in the health of your animals and would encourage you not to hesitate to call if you need information or have questions. From time to time, we will include information within our webpage that may assist you in the care of your pets.